What started out as a book chapter ended up as a technical book with 75 tables and charts. This is an investor’s guide to active value investment, with some humor sprinkled in. It was digested for the general public in the Little Book that came out in 2010. 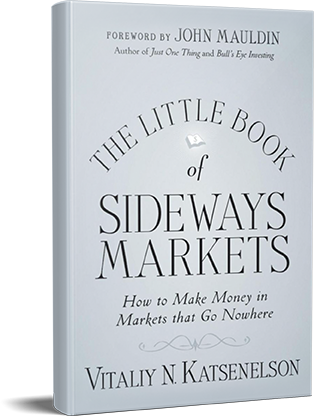 The Little Book of Sideways Markets isn’t just a simplified version of “Active Value Investing.” Published 3 years after its predecessor, The Little Book also benefited from Vitaliy’s experience in explaining its concepts in hundreds of interviews and dozens of presentation. The result is a more polished explanation of the material, geared to the layman. A thoroughly enjoyable read. Provides a clear framework for equity investing in today`s sideways and volatile markets useful to everyone. Clear thinking and clear writing are not often paired – well done! This book reads like a conversation with Vitaliy: deep, insightful, inquisitive, and civilized. Vitaliy Katsenelson walks you through his thought processes in constructing an active value portfolio. There is not enough discussion in value investing circles about when to sell stocks, and this book advances that subject. A good balance between theoretical discussion, real anecdotes, and commonsense observations. I never set out to write a book, much less two of them. Writing my first book was an accident, though a good one. In 2005 a friend was putting together a book. Actually he was “editing” a book: He asked a dozen professional investors to contribute chapters, and he wrote the introduction to the book and a chapter of his own. He was nice enough to ask me to contribute a chapter. I agreed. Writing a chapter was not too intimidating – I just stitched a few articles together. By a lucky coincidence, right about that time I wrote an article for the Financial Times in which I laid out my thesis on sideways markets (though at the time I still called them“oscillating bear market”). I put a lot work into researching that topic and thought I could build on it. I started expanding my article into a chapter, but by the time I was done, the chapter had ballooned to a length equivalent to five full-grown chapters. It was too big for my friend’s book and too short for a book of my own. But I showed what I had to Wiley, and they thought I should turn it into a book. 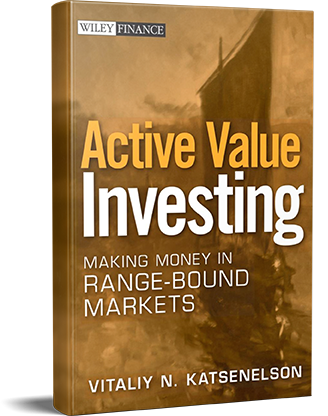 Eighteen months of hard labor, long weekends, sleepless nights, and a lot of lost hair later, I had written Active Value Investing, which was published in September 2007. A “sideways market” is a term Vitaliy coined to describe a long-term (10+ years) market environment that goes up and down, but at the end of its torturous journey ends up not far from where it started. Below is an overview of his thesis on sideways markets as explained in his two books. Every long-lasting bull market of the past two centuries was followed by a sideways market that lasted about 15 years. The Great Depression was the only exception. Despite common perception, secular markets spend a lot of time in bull or sideways phases, and roughly an equal amount in each. Stock prices are driven in the long run by two factors: earnings growth (or decline) and price-earnings expansion (or contraction). Prolonged bull markets start with below-average P/Es and end with above-average ones. Sideways markets follow bull markets. They rid us of the high P/Es caused by the bulls, taking them down to and actually below the mean. P/E compression — a staple of sideways markets — and earnings growth work against each other, resulting in zero (or near-zero) price appreciation plus dividends. Become an active value investor. Traditional buy-and-forget-to-sell investing is not dead but is in a coma waiting for the next secular bull market to return — and it’s still far, far away. Sell discipline needs to be kicked into higher gear. Increase your margin of safety. Value investors seek a margin of safety by buying stocks at a significant discount to protect them from overestimating the “E.” In this environment that margin needs to be even more beefed up to account for the impact of constantly declining P/Es. Don’t fall into the relative valuation trap. Many stocks will appear cheap based on historical valuations, but past bull market valuations will not be helpful again for a long time. Absolute valuation tools such as discounted cash flow analysis should carry more weight. Don’t time the market. Though market timing is alluring, it is very difficult to do well. Instead, value individual stocks, buying them when they are cheap and selling them when they become fairly valued. Don’t be afraid of cash. Secular bull markets taught investors not to hold cash, as the opportunity cost of doing so was very high. The opportunity cost of cash is a lot lower during a sideways market. And staying fully invested will force you to own stocks of marginal quality or ones that don’t meet your heightened margin of safety. What if a sideways market isn’t in the cards? If a bull market develops, active value investing should do at least as well as buy-and-hold strategies or passive indexing. In the case of a bear market, your portfolio should decline a lot less.